All our Radioisotope sources are NRC Exempt 'safety sealed' sources. The radioactive material in the disks cannot be removed or altered - it is fused and part of the plastic/epoxy disk. The disks measure 1" in diameter and just under 1/8" thick. These radioactive sources are low level and exempt from Nuclear Regulatory Commission (NRC) regulations and licensing. They do not require any sort of special handling or storage, and they can be discarded with normal trash if they are no longer needed. Since the quantities dealing with radioisotopes are so small (the actual amount of radioactive material in the disks is so small it is invisible to the eye), radioisotopes are sold by the 'microcurie' (uCi). The Curie (Ci) or Microcurie (uCi) is the standard unit of measurement dealing with radioisotopes. All our Disk sources are within 20% of their stated value. 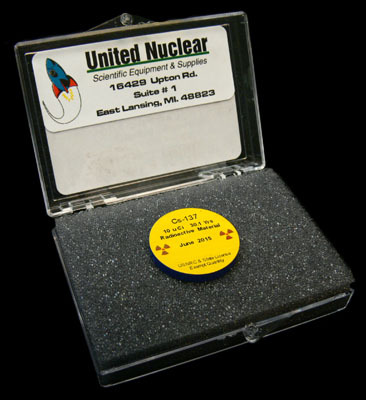 For an additional $130, Gamma sources can be specially manufactured and calibrated against a Gamma radiation Standard. These calibrated sources will be accurate to within 5% of stated values and will include a calibration certificate. Please call us at 517-919-6019 if you wish to order a calibrated Gamma source. Calibration is only available for gamma sources. Below is a list of the currently available Disk sources, the type and energy of the radiation they emit, their half-life, and the activity (in microcuries) that are available. There are a variety of isotopes available that emit Gamma or Beta Radiation (or both), but there is only one isotope available emits Alpha radiation, Polonium-210. The Polonium-210 source disk is unique in construction and is an open window design. The source material is mounted in the recess of the plastic disc with an aluminized Mylar window. This design yields excellent transmission of Alpha particles without window losses. To ensure the longest half-life possible, all isotopes are fabricated to order and shipped directly to you from our NRC licensed nuclear isotope manufacturing facility in Oak Ridge, TN. Please allow 7-10 days for isotope fabrication & shipping. Because of the way our online shopping cart program operates, ordering several disk sources may have shipping charges calculated incorrectly. As we are charged about $15 for shipping to you from the lab, we have to enter the weight of the sources as 10 pounds to get the charges to calculate properly. This is fine for 1 or 2 disks, but if you order several, we suggest you call us to place your order so you are not overcharged for shipping. Also, if you are ordering many sources at once, (depending on the particular activity of the sources) we may have to include a lead pig to comply with postal regulations - which is an additional charge. Once again, using the automated checkout for 1 or 2 disks is fine, but please call for ordering larger quantities. you cannot return or exchange any isotope product for any reason. NOTE: POLONIUM-210 IS CURRENTLY UNAVAILABLE EITHER AS AN INDIVIDUAL DISK SOURCE OR IN DISK SETS. WE WILL UPDATE THIS PAGE AS SOON AS IT BECOMES AVAILABLE AGAIN.